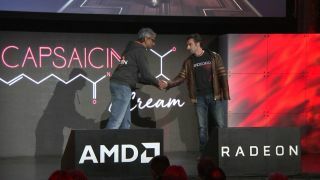 AMD just wrapped up its Capsaicin & Cream 2017 event today to show developers and fans alike what's next for the graphics technology firm – as well as its latest partner: Fallout series creator Bethesda Softworks. Held during this year's Game Developer Conference, the event teased not just some of the features coming to the AMD Vega GPU architecture – its cards to now be known as Radeon RX Vega. But, perhaps most importantly, AMD also revealed the company's newly made alliance with Bethesda. Known for putting out games such as Fallout 4, Doom, and the Elder Scrolls series, Bethesda is teaming up with AMD in a long-term strategic partnership in an effort to further its PC gaming technologies. More important than even a melding of mutual minds in the realm of PC gaming, AMD's partnership with Bethesda looks to spell better-optimized games for PCs running the publishers games past, present and future. AMD hopes buddying up with Bethesda will maximize the capabilities and computing power of its GPUs, including its AMD Ryzen and Vega cards, across the game maker's library of titles. "Working independently, game developers and graphics companies will eventually address the challenges of this new era of gaming," said AMD senior vice president and chief architect Raja Koduri, "but working in close collaboration, the pace of that progress can advance exponentially." This means Bethesda games could potentially receive improved performance on computers running AMD tech, though exact details of how this would be accomplished (and when) were not provided. While noticeably lacking in any hard details like price or release date for AMD's Vega technology, the announcement still demonstrated a healthy number of the upcoming GPU's talents. Designed with VR and 4K UHD gaming in mind throughout, Vega will feature High Bandwidth Cache Controller (HBCC) features to lower strain on graphically-intensive games and Rapid Packed Math (RPM) capabilities to cram exponentially more details into a frame, like individual strands of hair. Vega will also be part of another AMD partnership, this time with LiquidSky - a game streaming service that plans to use Vega tech to beam top-tier games to not-so-powerful devices, like low-spec Windows laptops or even Android phones.